After a 15-hour flight from Dallas, I had an 8-hour layover in Dubai--which included a hotel room that I used only for a quick shower and change of clothes. To make the most of my time in Dubai, I asked a cab to to be my driver for the day. I hadn’t studied much beforehand, so I let him decide what to show me. My driver was Pakistani and lucky for me, spoke enough English to understand me. After the first couple of stops, I realized he was only taking me to the typical touristy places…we stopped at the Burj Khalifa (tallest building in the world), and the Dubai Mall (a place I came to appreciate later on the trip), and the self-proclaimed “7-star” hotel, Burj Al Arab. Although impressive, I wasn’t too inspired to take out my camera. After snapping a few pics, I asked my driver to take me somewhere I could find more of the locals working, shopping, and hanging out. He knew the perfect place, although by then, I had only a couple of hours left before my continuing flight to India. We went to an old spice market, Dubai Gold Souk, off the Dubai Creek. It was exactly what I wanted to see. After walking through the market, I spent some time talking with a few locals working on their ships–old, wooden ships equipped with electronics like refrigerators & TV’s. I found most people to be very friendly–some even asking me to take their picture. 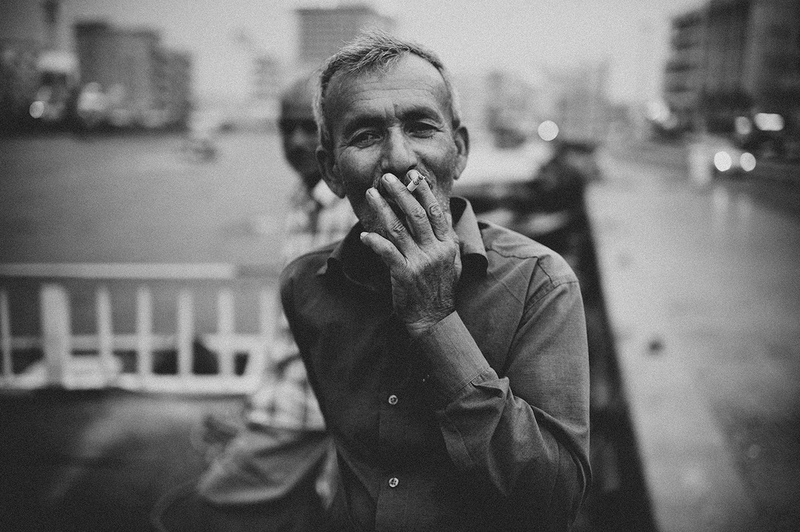 The man pictured above insisted I take several shots of him puffing on his cigarette. At this point, I was alone--without the driver. I planned to walk around on my own and then grab a new cab just before I needed to be back at the airport. About half-mile out, I was confronted by a man from Iraq. He quickly let me know that he was from Iraq and then waited for some kind of reaction--I wasn't sure if he thought I should be excited, upset, or interested. But, I honestly had no reaction. After a few looks and exchanges, his disposition changed and then he asked me to take this picture with his friends. Dubai is an interesting place--and was surprised to find out new the city was--even the old spice markets weren't older than 100-200 yrs. 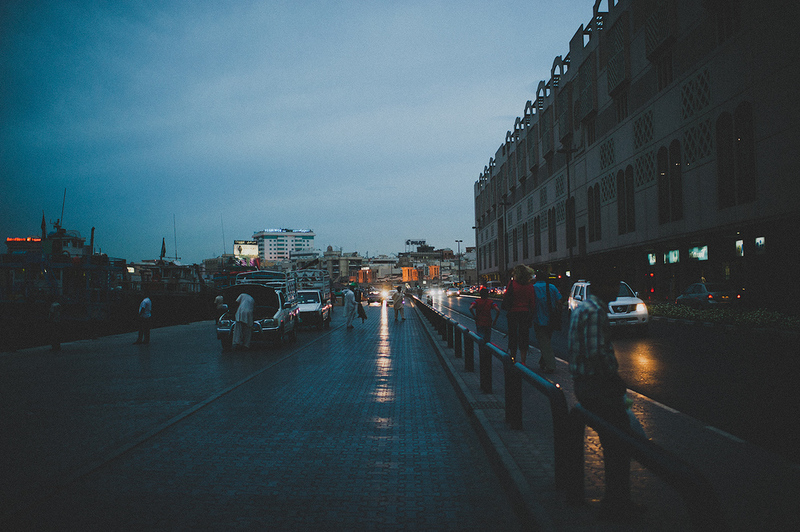 The images above display the stark contrast between the more urban, modern setting you find at the Mall of Dubai and the traditional, cultural experience near Dubai creek. 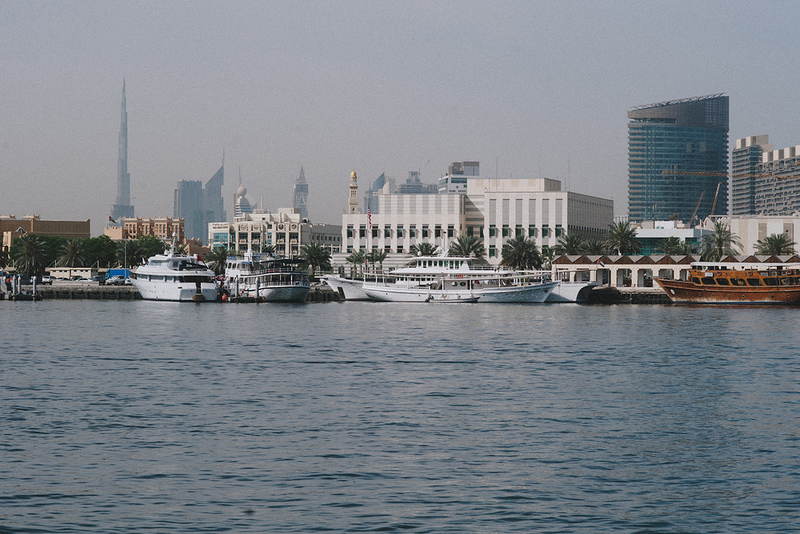 Notice the Burj Khalifa and the skyline in the background of the boats. It seemed like Khalifa was visible from any point in Dubai.